Who do you believe goes above and beyond in our schools to meet our KPBSD mission? Kindly nominate a staff member, volunteer, student, business or community partnership to be recognized for outstanding service and contributions to educating our students. 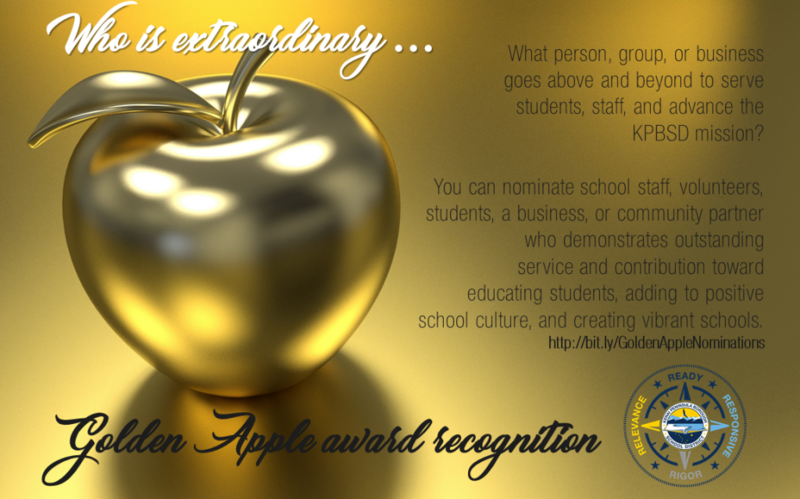 Read the Golden Apple recognition rubric below. Complete the nomination; make sure to include details and specific stories that demonstrate above and beyond service or contributions. The recognition committee reviews nominations on a monthly basis; you will be contacted when your nomination is received, and when the process is complete. Thank you for your #golden story about someone who goes above and beyond in or for our schools. Kindly return your nomination to the Communication department office by email, mail, or fax. Contacts are located at the bottom of the nomination form. Recognition takes place during the monthly Board of Education meeting. This entry was posted on July 26, 2018 at 3:30 pm. You can follow any responses to this entry through the RSS 2.0 feed. You can leave a response, or trackback from your own site.